This holiday season, it will take the storm of the century, one stage-struck young boy, a certain meddling “angel”—and even a cranky cat—to convince two bruised hearts that second chances can lead to the love of a lifetime. 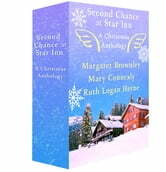 When Amanda Star inherits her family’s historic inn at Christmas, she takes one more trip back home to put the beautiful old bed and breakfast up for sale and runs into an old friend – and crush – Anthony Cart. Surrounded by memories of warmth and laughter, tinsel and holly, can Cart help Amanda realize the hospitality industry is far more than spreadsheets and bottom lines in time for Christmas? More Grinch than grace, cowboy Jed Taylor is determined that his best friend’s very pregnant widow won't make the long trek home for Christmas alone, but when a blizzard lands them at a town hunkered down to ride out the unexpected storm, they begin to see that facing this once-dreaded Christmas together could be the very best way of all.